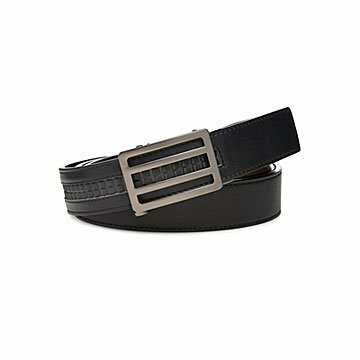 Zip your way to the perfect fit with this finely adjustable vegan belt. Taking an awl to poke a hole in between notches in your belt is so 20th century. If you had to look up "awl," we rest our case. This reversible, vegan belt features a hidden track and ratchet system that lets you adjust the size through 40 stops of 1/4" increments. So whether you've just enjoyed a big holiday feast or have dropped a few pounds for the summer, you can zip your way to the perfect fit. Sleek, light, and stylish, this belt adapts to any outfit and waist size (24" - 46"). Buckles designed and made in California. Belt made in China. 6" L x 6" W x 2" H; Waist Size: 24" - 46"
Reversible - Black and Brown. Care: Wipe clean with a damp cloth. One Size Fits Most: Waist Size: 24" - 46"
My husband really likes the look of the belt, and the leather was very nice. The only downside to the belt is that it did not come with a loop to tuck the end into. He hasn't worn it yet, 2 weeks later, because of this. I am sure he will get use to it, but until then it's a bit of a pain.